It starts with a series of unexplained events. Earth tremors across the globe. Women being driven insane by their heightened and scrambled senses. And the world is starting to notice – the number one Twitter trend is #realfemmefatales. Governments and scientists are bewildered and silent. The world needs Torchwood, but there’s not much of Torchwood left. Captain Jack has tracked the problem to its source: a village in Peru, where he’s uncovered evidence of alien involvement. In Cardiff, Gwen Cooper has discovered something alien and somehow connected to Jack. If the world is to be restored, she has to warn him – but she’s quickly becoming a victim of the madness too. 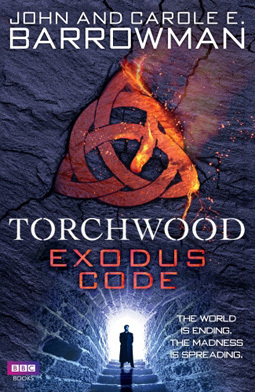 Torchwood: Exodus Code was published in the UK by BBC Books on 24 September 2013 and is now available from online retailers, including Amazon, and in all good bookstores. It is available in print and audio-CD editions. © John and Carole Barrowman. All Rights Reserved.